With autumn here and winter on its way, now is the time to give your horse and gear a “warrant of fitness”. A lot of people turn their horses out for the winter and give them a rest, especially if it has been a busy season with lots of shows, tournaments or trail rides etc. Rather than blobbing out in front of the telly why don’t you take the time now to get your horse or pony, yourself and all your horsey gear up to scratch so when your riding time does roll around again you are all ready to go and have fun. 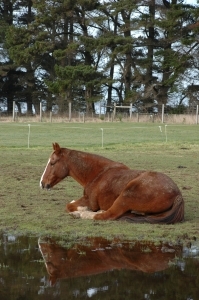 Make sure your horse’s cover is suitable for the winter. Check all the straps. If it needs repairing do it now as your saddler will appreciate a dry cover far more than trying to sew a wet, muddy one. Check that it still fits the horse – especially if you have a young horse that may have grown – as nasty rubs can soon develop. Is it still waterproof? Again this is easier done on a nice day with a dry cover. If your horse or pony hasn’t had a cover on before don’t assume you can throw it on and just let him go! Terrible injuries can occur from a terrified youngster blindly bolting away from the “monster” on its back. Take the time to introduce a cover to your young horse. Do this on a calm day and give yourself plenty of time. Fold the cover into three and gently place on the horse’s back. Once he is used to this, move it up and down and unfold it so it covers him. Make sure you put the cover on and take it off from both sides; taking care the surcingle straps don’t whack his legs or flanks. If he is accepting and calm, quietly lead him around. Sometimes baby horses are quite happy till they move and the cover rustles and then they panic. If you lead them around a bit or better still leave them in a stable or small safe yard they can get used to the cover without hurting themselves. I usually spend a few days in the paddock with our young ones putting the cover on and taking it off, dragging it around and making sure the yearling is quite blasé about the whole thing before finally letting them go with the cover on. 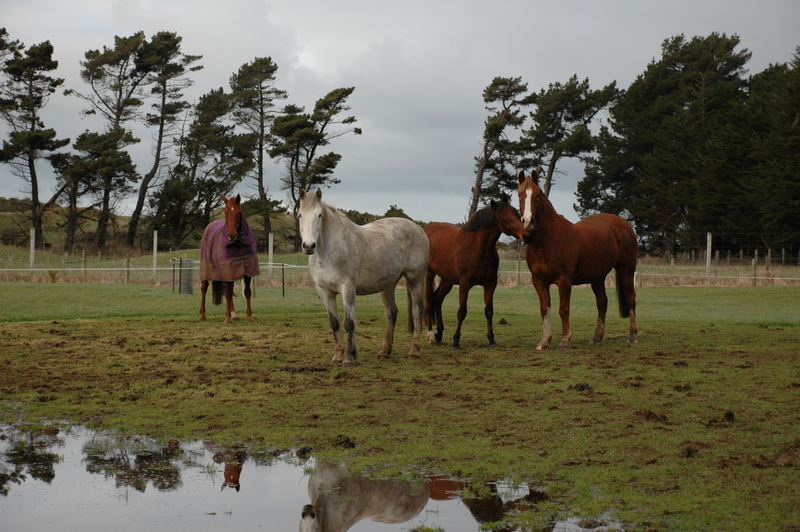 Remember that horses with covers on need checking daily and the cover removed regularly. Saddles, bridles and other tack need checking too. As you clean each piece check the stitching for rotting or weakness. Pay special attention to girths and the girth straps on the saddle as they take a lot of stress. Believe me, it is awful when they break! Check your halters periodically too, they are used daily and it is too late when they finally break and your pony runs off. The rubber treads on stirrup irons do wear and become slippy over time but are cheap and easy to replace. Bits wear too and need to be checked for sharp edges. If you still have old nickel ones replace them with Stainless Steel. Helmets should always be replaced after a hard fall. Although everyone gets a warrant of fitness for their float or truck do you check it for general horse safety? If you aren’t up to doing it yourself get someone who does to check your horsefloat over for signs of wear. Is the floor safe and up to holding the weight of your horse? Is the ramp secure, solid and non-slip? Do the springs on the ramp need adjusting? Are the internal partitions OK or are they cracked and worn? Will the horse catch himself on any loose bits inside? Any rivets missing need to be replaced. As well as weakening the construction it usually contributes to extra noise in the float. It is amazing how few people have travelled in their float and so are unaware of all the rattles and bangs. We sit in our float and drive up and down the drive to see if any noise can be reduced. We have a very long driveway but you could always drive around your paddock. Doing this also makes you aware of how turning sharply and stopping abruptly affect the horses balance. I saw a horse pull back at a truck once and the whole rail came off the side of truck resulting in a badly injured horse as it galloped away with the metal rails banging round its hocks. If there is a cupboard or storage space in your float it is a good idea to have a horse first aid kit. Include the following: a couple of bandages, tape, antiseptic cream; disinfectant. A torch kept in the float is a good idea too, as well as a spare halter and lead rope. Is your horse or pony ready for winter? Horse’s teeth can develop sharp edges which can make eating painful and lead to infections and abscesses. It is a good idea if you have an older horse or pony to get their teeth checked before winter. Ideally you should get their teeth checked every year. Worming needs to be done on a regular basis and feet still needs attention even in winter, although hoof growth will slow down somewhat. Make sure you have enough hay as it is more expensive to buy in winter. Some horses will need supplementary feeding as well as hay to keep condition on. Introduce hard feed gradually as colic may result from a sudden change in feeding. Have a salt block in the paddock. Check that troughs are clean and working properly and remember you may have to break the ice on very frosty mornings. Now you have all the gear sorted and in tip top condition what about yourself? Take the time this winter to think about your riding. Assess your abilities and set some goals for the season to come. It may be you want to be more confident hacking out, want to work on your position or want to compete at the next level up from where you are now. Whatever your goal, identify it and work towards it. Figure the steps needed, write them down and get started! Read books, gets some videos, go on a course, talk to horsey people you admire and learn from them. Get fit; before you start riding again do some walking, biking or whatever so that it is easier for you and the horse. It makes it hard for the horse if you are stiff and sore as your position is not as balanced. Winter will go by in no time and you will be well prepared to enjoy your horses on those long summer days!